Chinese scalp acupuncture is a contemporary acupuncture technique integrating traditional Chinese needling methods with Western medical knowledge of the brain. Scalp acupuncture is a modern technique with just 39 years of history. Scalp acupuncture has been proven to be the most effective technique for treating acute and chronic central nervous system disorders. 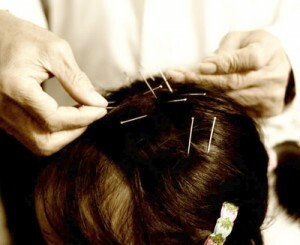 Scalp acupuncture often produces remarkable results with just a few needles. It usually brings about immediate improvements, sometimes taking only several minutes. Scalp Acupuncture has proven an effective technique for patients who suffer from seriously debilitating conditions, such as stroke, multiple sclerosis, spinal cord injury, traumatic brain injury, Bell’s palsy, phantom limb pain, fibromyalgia, aphasia, vocal cord paralysis, Meniere’s syndrome, Down’s symdrome, seizures, PTSD, essential tremor and Parkinson’s Disease. Possible Treatment for Symptomatic ACII?? ?